This is it in a nutshell… well 11 nutshells. When it comes to caring for leather upholstery, these are the golden rules. Whether you have invested in leather furniture, a leather boat lounge, leather car seats or apparel, these essential guidelines show you how to get the best out of your investment. Usually, a spill isn’t a stain until it has time to set in. Have the right products on hand for when accidents happen and you can forget it ever happened. Household products are a No-No. It simply isn’t worth the complications down the track so stick to leather care products and don’t be duped into using potentially damaging substitutes. A light wipe over every 3 months is easy work. Leave it for a few years and the grime will have settled deep in the grain and will be much more difficult to remove. A light clean every 3 to 6 months will keep your leather looking beautiful and in fine condition. A light condition every three months helps to keep the luxury in your leather. Don’t overdo it, just do it regularly. 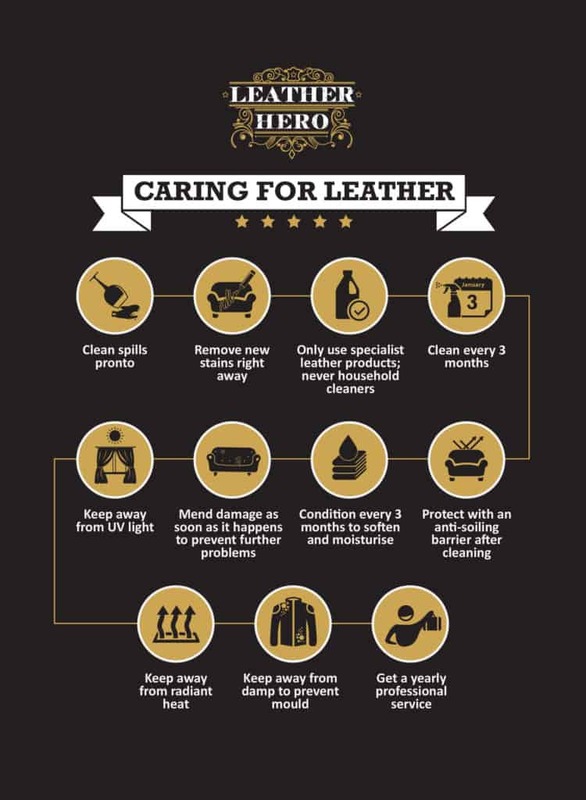 Science and nature have something to help you care for your leather. A good leather protector offers a wipe-on, breathable protective shield that improves cleanability, resists stains and blocks UV. Use it from Day 1 when your leather is in showroom condition and enjoy that lush new leather feeling for much longer. UV is no friend of leather. It quickly dries out the inner fibres and leaves your upholstery brittle and very ready to tear. When it comes to caring for leather, misinformation and mysteries abound. Stick to these 11 truths to ensure that leather upholstery stays beautiful for longer. Air vents and heaters can silently evaporate the moisture balance from your leather leaving it parched and brittle. Take care to place them apart. High humidity, rising damp or storing leather whilst still damp can create the perfect environment for mould spores to flourish. Good natural airflow and complete drying will help to prevent mould and mildew. The oldie truism says it all; “A stitch in time saves nine”. Small rips only grow bigger. Our tip? repair or have them repaired before they deteriorate. For some, a yearly service is too much, for others, it’s very much needed. Some sofas work day and night, others are seldom used showpieces. Some homes have pets or children, some recliners are occupied every day, some sofas are in busy hotel foyers and others are in a spare room that’s only inhabited by guests at Christmas. The same goes for car and boat seats and lounges. Whatever the usage, if you don’t get around to a 3 monthly once-over, have your leather professional do it for you. In conclusion, neglected leather is unpleasant to live with and tends to perish early. Well maintained leather, on the other hand, lasts around 3 times longer. And while it does that, it looks and feels beautiful.